I’ve decided it is now officially the silly season! My Christmas tree is up, my kitchen is swinging with Christmas-themed treats and I have actually started my Christmas shopping. 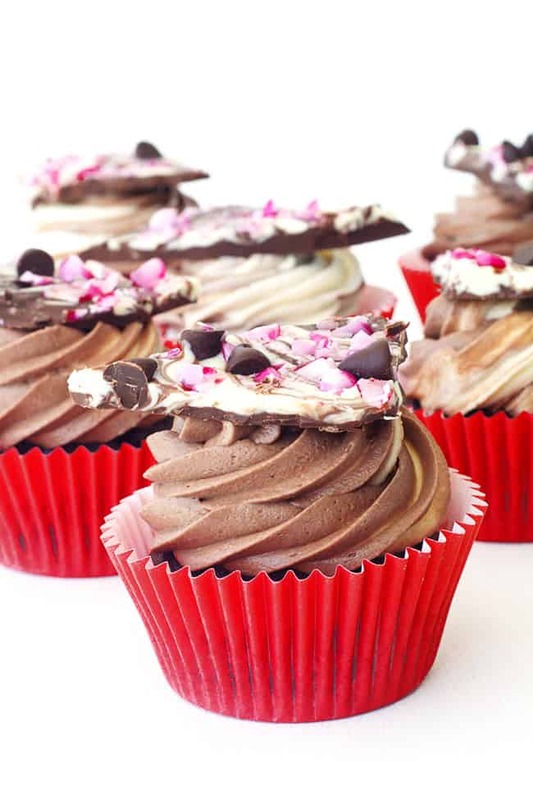 So let’s celebrate all things Christmas with these fabulous Peppermint Bark Chocolate Cupcakes! Soft chocolate peppermint cakes topped with swirled peppermint and chocolate buttercream and a chunky piece of Swirled Peppermint Bark. 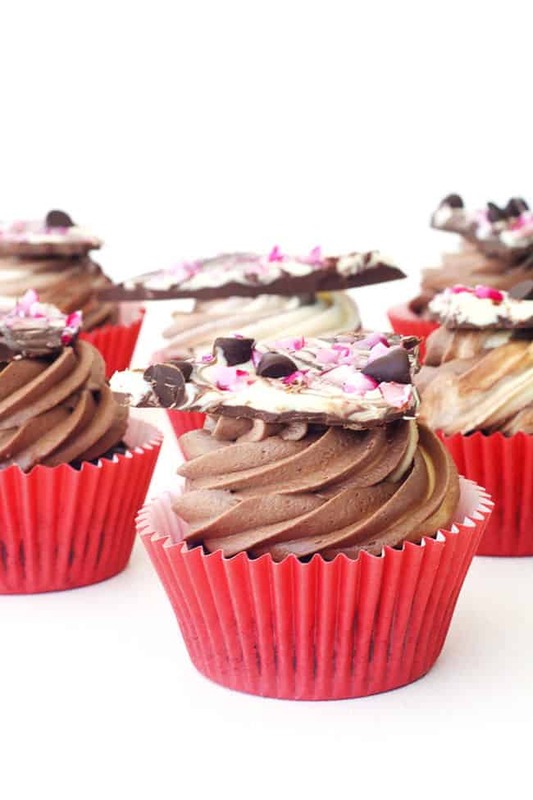 It’s the perfect storm of all things chocolate and peppermint in one gorgeous cupcake! I couldn’t wait to make Peppermint Bark this year, one of my favourite American-inspired Christmas treats. But what to do with all the bark (apart from eat it by the handful)? Make cupcakes of course! There are many different ways to make Peppermint Bark but I love to use both dark chocolate and white chocolate to make beautiful swirls. I thought I would continue the swirled theme by doing a two tone frosting, like my M&M Surprise Cupcakes with Rainbow Frosting, using chocolate buttercream and peppermint buttercream. 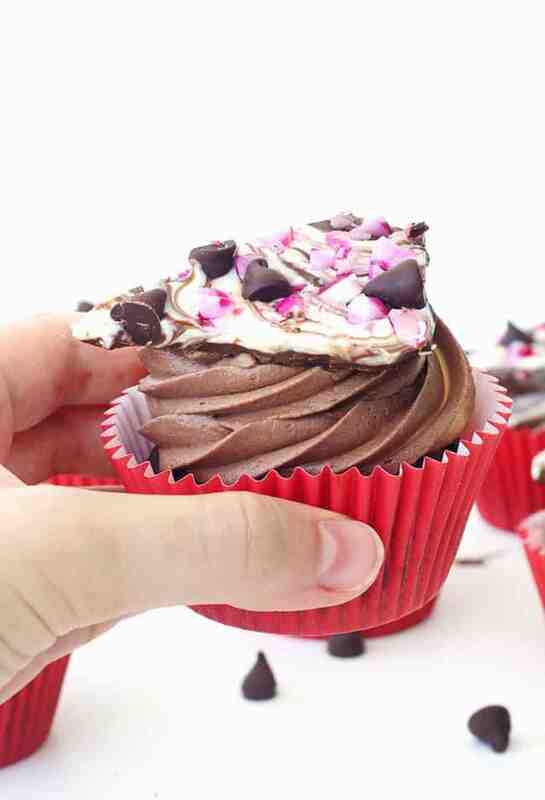 I love adding a little extra decoration to my cupcakes, like a piece of Rocky Road or a Chocolate Cookie. It really makes them really stand out, plus you get to eat two treats in one! Win win! 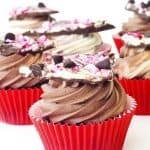 These Peppermint Bark Cupcakes will be a showstopper for any Christmas party or celebration, especially if you have any friends or family who adore chocolate and peppermint and can eat Peppermint Bark for breakfast. Gosh, after writing this, I really feel like eating a cupcake or two. Soft chocolate peppermint cakes topped with swirled peppermint and chocolate buttercream and swirled peppermint bark. 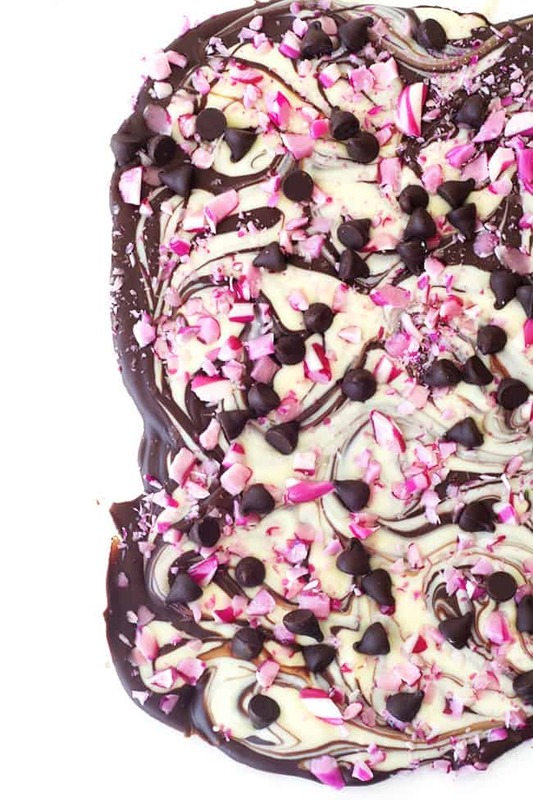 To make your peppermint bark, first line a baking tray with baking or parchment paper. Crush your candy canes using a mortar and pestle or pop them in a sandwich bag and bash them with a rolling pin. Place your dark chocolate in a microwavable bowl and pop in the microwave for short bursts, stirring every 10 seconds, until completely melted. 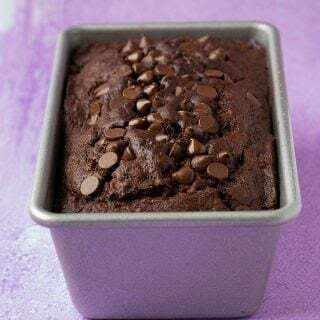 Pour on your prepared sheet and spread out using a plastic spatula (try not to make it too thin). Then, place your white chocolate in a microwavable bowl and pop it in the microwave in short bursts, stirring every 10 seconds, until completely melted. Add your peppermint extract and stir. Then dollop the white chocolate over the dark chocolate and then gently swirl using a knife. Before the chocolate melts, sprinkle over your candy canes and your chocolate chips and pop into the fridge to set. Preheat the oven to 180C (360 F). Line a 12 hole muffin tin with patty cases. 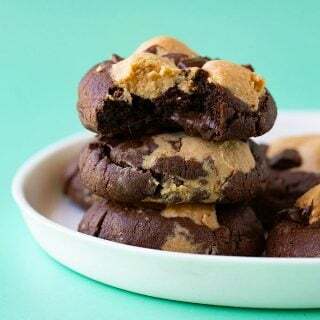 In a large mixing bowl, sift the flour, cocoa powder, baking soda, baking powder and then add the sugars – give it a little stir. Pop the butter into the microwave for a short burst, 10 seconds or so at a time, until it is just melted. Give it a stir with a fork to eliminate any lumps. In a separate mixing bowl, add the eggs, vanilla and butter and whisk together until smooth. Then add the wet mixture into the dry mixture, along with the buttermilk and gently fold until just combined. Add the peppermint extract and stir through. Spoon the mixture into the prepared patty cases and pop into the oven. Bake for 18-20 minutes or until just cooked through. Set cakes out onto a wire rack and leave to cool completely. In a large mixing bowl, beat the butter until creamy and smooth and then sift in half the icing sugar. Add a tablespoon of milk or two to help loosen up the mixture. Add the rest of the icing sugar and continue to beat. Add a tablespoon of milk as needed. The icing should be nice and creamy but thick enough to hold its shape. The separate the frosting into two bowls. Add the peppermint extract to one half and stir through. Then sift in the extra tablespoon of cocoa powder to the other half. 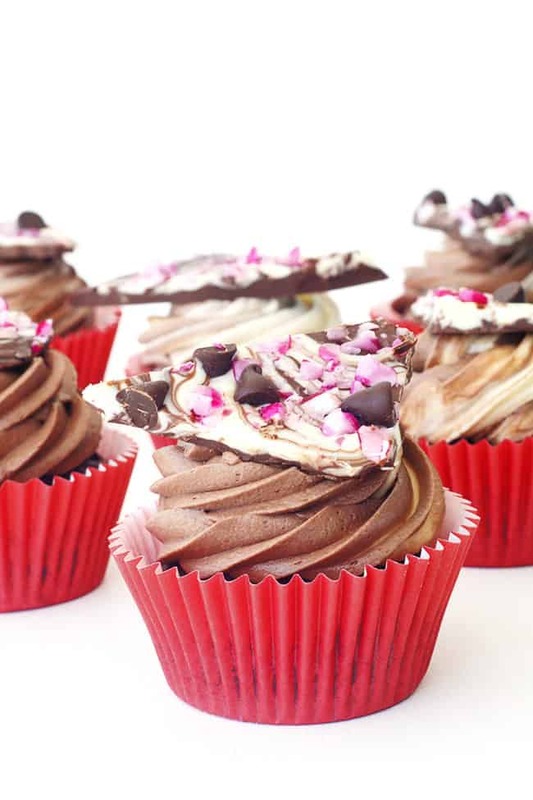 To pipe the swirl icing, grab a disposable piping bag fitted with a star tip, add half of your buttercream down one half of the bag, then add the other half. The first swirl or two will probably only have one colour but after that the frosting should come out in a swirled pattern. Pipe the icing onto your cupcakes. Finally, grab your peppermint bark out of the fridge, break it up into small pieces using your hands and place a piece on top of each cupcake. Enjoy! 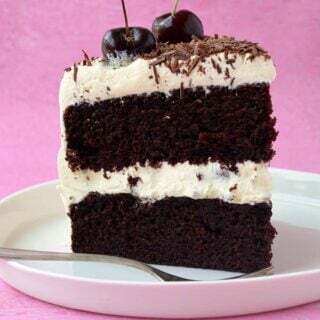 Chocolate and peppermint is delicious combination. These barks look fabulous and festive, Jess. I just love these! Peppermint bark is one of my favorite things, but I definitely need the cupcake to fill me up, otherwise I’d have to eat the whole pan of peppermint bark 😉 SO festive! I love peppermint bark, especially this time of year! Love that you topped it on the cupcakes, such a fun idea! I’m so excited for Christmas! I’m "hyped for the holidays" and I can’t lie! These cupcakes look beyond delicious!! YUM! …and I LOVE that you added peppermint bark!! What a lovely addition! SO festive! Yay for Christmas and these cupcakes! They look gorgeous and I love the peppermint bark topping you added 🙂 They’re so festive and perfect for the holiday season! Jess you have totally outdone yourself. These are seriously the prettiest little cupcakes!! These cupcakes look seriously UNREAL! They are too pretty and I love that you topped them with the peppermint bark! I feel like I barely had time to catch my breath before Christmas exploded but I’m happy because it is my favorite time of year. I’m loving these gorgeous cupcakes! I know, I feel the same Nicole! But bring it on, I say! Oh my goodness, you slay me Jess! Seriously, these are so gorgeous! I’m ready to get into the holiday season full swing, and this is perfect for it. Pinning! Aww thank you Meghan! And for pinning! Yay! Oh my gawsh, you are like 7 bazillion steps ahead of me when it comes to being prepared for Christmas! I salute you, my dear! Maybe if I had some of these seriously cute cupcakes in my belleh, I’d feel some sort of motivation? Doubtful, but I would like to sit on my lazy bum and just devour a bakers dozen of these! Not only are these cupcakes cute, they sound delish! LOVE the peppermint bark on top! Cheers, my dear and thanks for sharing the YUM! Aww thank you Cheyanne! I don’t feel very organised but I’m trying! Hahaha! The Christmas present shopping has taken a back seat this year though, I need to get onto it! Omg! They look so good! I would love at least one! Love this idea!! The combining of two wonderful things 🙂 Your bark is extra pretty! Jess! These are amazing! 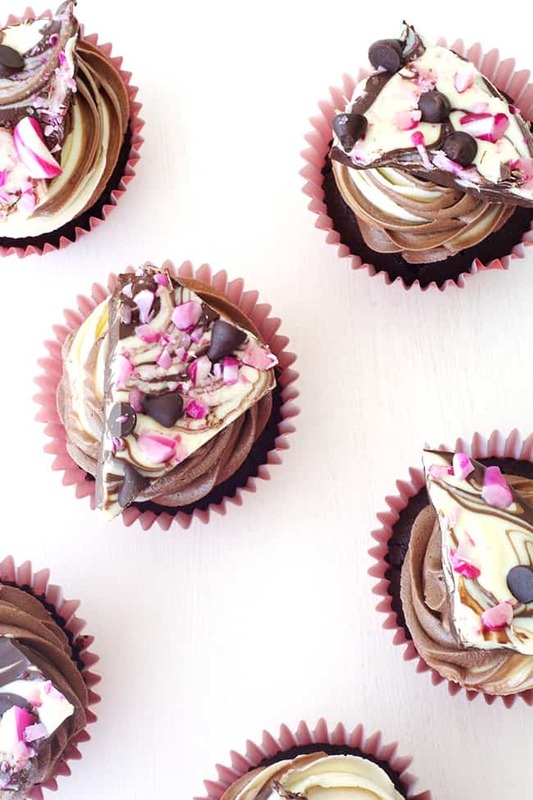 I love that gorgeous swirled peppermint bark – I don’t know if any of it would make it onto the cupcakes. We are putting out tree up tonight and I know some of these cupcakes will have appear in our kitchen very soon! Thank you so much Robyn! Well i may be a little biased but I think you can’t go wrong with either 😉 Let me know if you do! First of all the peppermint bark all by itself looks beautiful! I love homemade peppermint bark. But putting it with the cupcake like that looks so classy. Great combination. I love seeing all these festive treats popping up now! These peppermint bark cupcakes look so good! And so pretty, too!